We recently published a study in Scientific Reports titled “Comparing the model-simulated global warming signal to observations using empirical estimates of unforced noise”. Our study seemed to generated a lot of interest and we have received many inquires regarding its findings. We were pleased with some of coverage of our study (e.g., here) but we were disappointed that some outlets published particularly misleading articles (e.g, here, here, and here). Because there appears to be some confusion regarding our study’s findings, we would like to use this forum to clarify some points. Our study is mainly about natural unforced (i.e., internally generated) variability in global mean surface temperature. This is the type of variability that comes from natural interactions between the ocean and the atmosphere (i.e., that due to phenomena like the El-Nino/Southern Oscillation or perhaps the Atlantic Multidecadal Oscillation). This is in contrast to externally forced variability in global mean surface temperature which arises due to changes in atmospheric greenhouse gasses, aerosols, solar irradiance, ect. Most previous estimates of the magnitude of unforced variability have come from physical climate models. In our study we created an alternative statistical estimate of unforced variability that was derived from reconstructed and instrumental surface temperature records. 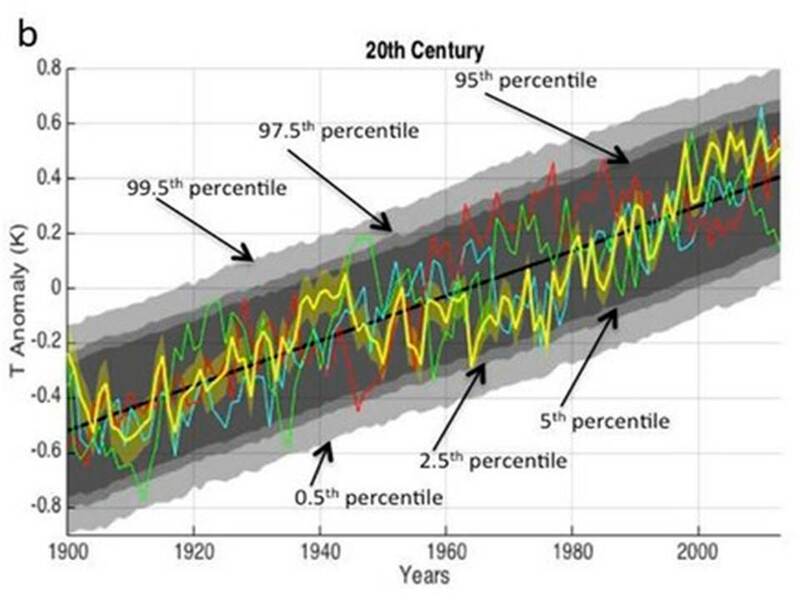 We then used this new estimate of unforced variability to aid in our interpretation of observed global mean temperature variability since 1900. We found that unforced variability is large enough so that it could have accounted for multidecadal changes in the rate-of-increase of global average surface temperature over the 20th century. However, our estimate of unforced variability was NOT large enough to account for the total warming observed over the 20th century. Therefore, our results confirm that positive radiative forcings (e.g., from human-caused increases in greenhouse gas concentrations) are necessary in order for the Earth to have warmed as much as it did over the 20th century. We also found that over the most recent decade-or-so, it is unlikely that the underlying global warming signal (the externally forced component of temperature change) has been increasing at a rate characteristic of the worst-case IPCC emissions scenario (more on this below). This last finding is what generated most of the attention for our article but it would appear that the finding has been largely misinterpreted. Part of the confusion stems form the Duke University press release which used the headline “Global Warming More Moderate Than Worst-Case Models”. The news department created this headline as a replacement for our suggested headline of “Global Warming Progressing at Moderate Rate, Empirical Data Suggest”. The news department wanted a shorter headline that was easier for the public to understand. Unfortunately, the simplification led many to believe that our study made a forecast for moderate global warming in the future, when in fact our conclusion only applied to the recent past. Question: What does your study conclude about Climate Sensitivity (e.g., how much warming we expect for a given change in greenhouse gasses)? Answer: Nothing. Our study was not concerned with assessing Climate Sensitivity and we have no particular reason to doubt the assessments of Climate Sensitivity from the IPCC. Question: Does your study show that the climate models used by the IPCC are useless? Answer: No. Results from our previous study indicated that the magnitude of unforced variability simulated by climate models may be underestimated on decadal and longer timescales and our new estimate of unforced variability largely supports this conclusion. However, our new statistical estimate of unforced variability is not radically different from that simulated by climate models and for the most part we find that climate models seem to get the ‘big picture’ correct. Question: Does your study indicate that the warming from the 1970s to the present may be natural rather than human caused? Answer: Our study is not explicitly an attribution study and we do not attempt to quantify the anthropogenic contribution to warming over the past ~40 years. However, we were interested in how much influence unforced variability might have had on changes in the rate of warming over the instrumental period. Specifically, we wanted to know if the real climate system is more like panel-a or panel-b below. In panel-a, the magnitude of unforced variability is small (represented by the narrow range between the blue lines), thus changes in the multidecadal rate of warming would necessarily be due to corresponding changes in the externally forced component of warming. 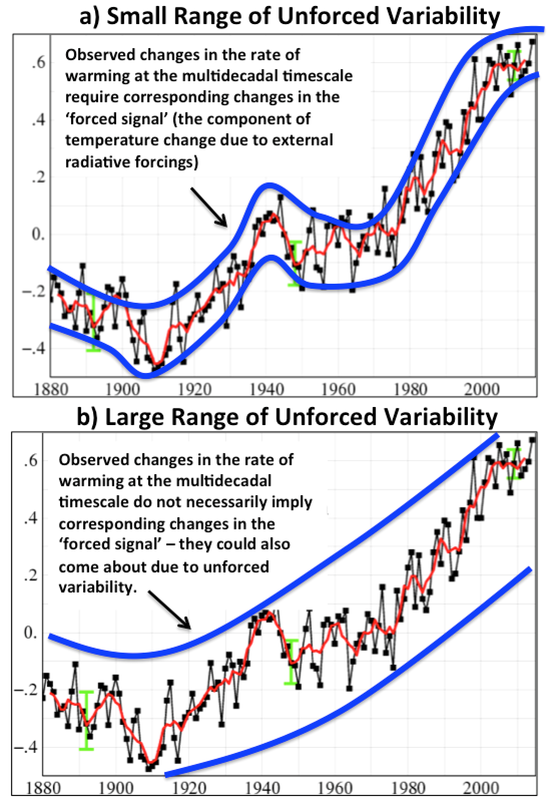 In panel-b the magnitude of unforced variability is large (wide range between the blue lines) and thus changes in the multidecadal rate of warming could come about due to unforced variability. The results of our study indicate that multidecadal changes in the rate of global warming can indeed come about due to unforced variability and thus the climate system may be more like panel-b than panel-a. This means that the accelerated warming over the last quarter of the 20th century does not ipso-facto require an acceleration in the forced component of warming. Instead, this accelerated warming could have come about due to a combination of anthropogenic forcing and unforced variability. This interpretation of the temperature record is consistent with the results of several recent studies. Question: Does your study rule-out the rate of warming associated with the IPCC’s RCP 8.5 emissions scenario? Answer: No. We used the multi-model mean warming associated with the RCP 8.5 emissions scenario (out to 2050) as a representation of the quickest rate of forced warming that could conceivably be occurring currently. We then asked the question “how likely is it that the forced component of global warming has been this steep, given recent temperature trends?” We found that it was not very likely to observe an 11-year warming hiatus (2002-2013 in GISTEMP) if the underlying forced warming signal was progressing at a rate characteristic the RCP 8.5 scenario. Since the mean radiative forcing progression in RCP 8.5 is likely steeper than the radiative forcing progression of the recent past, this finding cannot be used to suggest that models are overestimating the response to forcings and it cannot be used to infer anything about future rates of warming. We would invite all interested people to read the full paper (it is Open Access) for a more complete explanation and discussion of this complicated subject. Hi Patrick, thanks so much for all of your information. I would really like to read your paper from Scientific Reports that you say is open access but none of the links to the paper seems to work. Is it possible to post a link to a pdf version? Thanks!